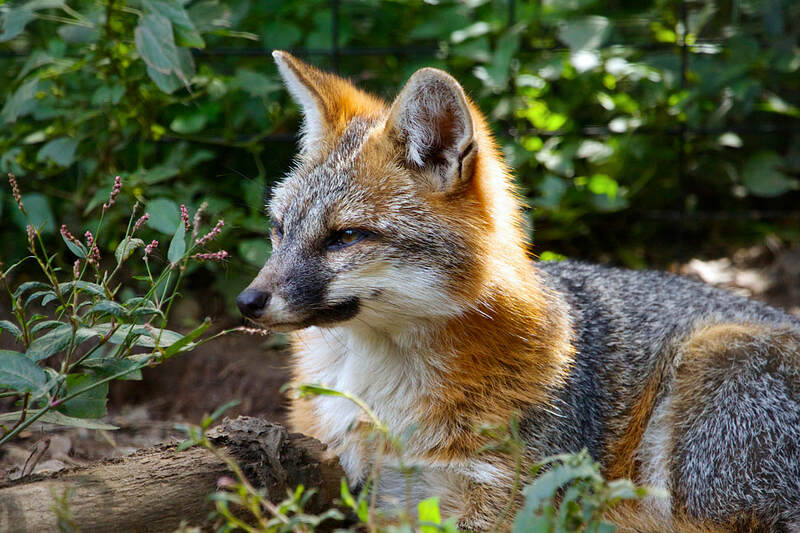 The Gray Fox looks like a small dog with a bushy tail but it is a wild animal not a pet dog. They can climb trees to escape predators and sometimes they climb to stalk and pounce on prey. They have long, hooked claws to grasp the tree trunk and scramble up and they can even move between branches. Although they prefer to hunt at night Gray Foxes can be seen about any time of day so they are considered crepuscular animals. The Gray Fox has a similar voice to a Red Fox but it is louder and less vocal. The Gray Fox is also called the Grey Fox and the Tree Fox. DESCRIPTION: The Gray Fox is so named for its peppery gray fur along its back and head. The fur on the sides and legs is a reddish brown. They have a long bushy tail with a black stripe down the center. They have large pointed ears, a pointed muzzle and long hooked, retractable claws. They can climb well and sometimes climb to rest safely in a tree. They make their dens in hollow logs, caves or crevices. 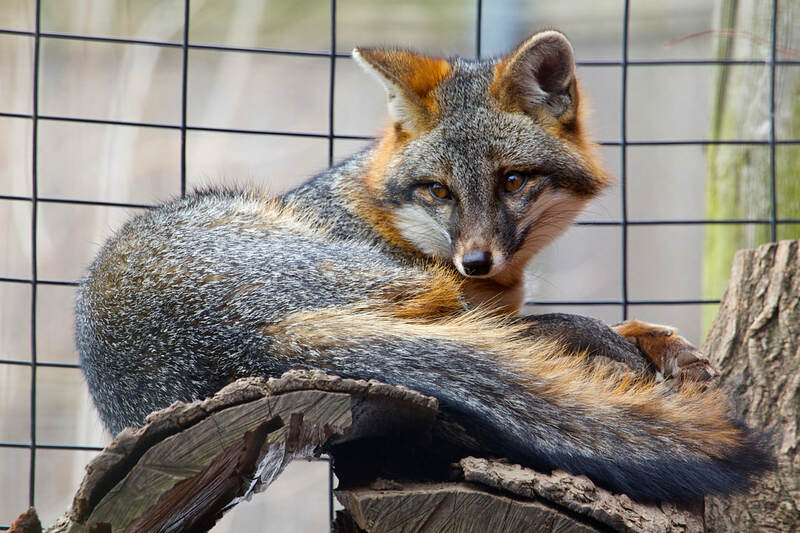 Gray Foxes have bodies that are 21 to 30 inches long but their tail can add up to another 16 inches. They weigh between 8 and 15 pounds. RANGE: The Gray Fox can be found as far north as Ontario, Canada and as far south as Venezuela. They like forests and bushy areas so they cannot be found in the Rocky Mountains or the central plains. HABITAT: They prefer woodlands and areas with lots of brush. DIET: Omnivore – small mammals like rabbits and mice make up the main part of the fox’s diet but they also eat birds, insects, grasshoppers and fruits and berries in season. FAMILY LIFE: Gray Foxes are monogamous. The female gives birth on average to 3 to 4 pups in the Spring. The male helps to feed the pups. The pups are weaned by the age of three months and can hunt on their own at around four months. They leave their mother and their den in the Fall. LIFE SPAN: The average life span is 8 years in the wild and 12 years in human care.